Now I am not saying I am not willing to try 'all' the independent bottlings that have been making their way into the Australian liquor stores in recent years, but I have to say I am not impressed. Over priced? I feel they all are (or at least what I have tried so far). Really...just because you put it in a barrel for X amount of years and have to pay the warehousing fees and maintenance does not justify the insult to recoup gains on something so screwed up. If your paying for barrel time then these things should be a hell of a lot better than the commercial bottlings...yes? Over the past year in particular I have tasted 6 independent bottlings and found all to be average at best. Most notable was a bottle of Laphroaig aged 15 years at 54% from independent bottler Cask Strength. A faint shadow of the commercial release. Man that was bad-bad-bad for the price I paid! What are my thoughts as to what is happening here? Probably the most important is the limited info one gets on these bottles. Extra aging a whisky that was only ever intended to be in the cask for 10 years makes you wonder why the independent bottler did not think "hey maybe they have tried it at 15 years and thought it was crap." Why leave it in the same barrel and not transfer to something else, for example a Madeira casking instead? It all equals risk and boldly going where the commercial distillers have already gone before. So what has brought on this post? Recently El Capitan graciously gave me a independent bottling of Macallan aged 17 years at 46% by Hart Brothers. I truly cannot say I enjoyed a dram or two, but it has brought into light just how problematic and risky these independent bottlings really are. I have had limited access to Macallan in the past but it has been enough to know this is no Macallan. It is riding the name and not the contents. Nose: Faint, light, with the sting of alcohol. Taste: Honestly there is nothing. Nothing at all! The slightest sweetness and dry straw that is instantly lost to the harsh alcohol on the middle of the tongue to the throat. Boring! Finish: Immediate, lacking interest or intrigue. Nothing to savour and nothing to look forward to. Do I really have to drink the rest of this? Overall a hard drink. When I gave a tasting to El Capitan it took him no less than 45min to get through the dram. OUCH! If I was to give a dram? 1 out of 7 just for the effort. As a side note: I have noticed with GREAT intrigue both Dan Murphy's and Vintage Cellars (for those in Australia) have both drastically marked down the prices on all these independents that have been sitting on the shelves for so long. 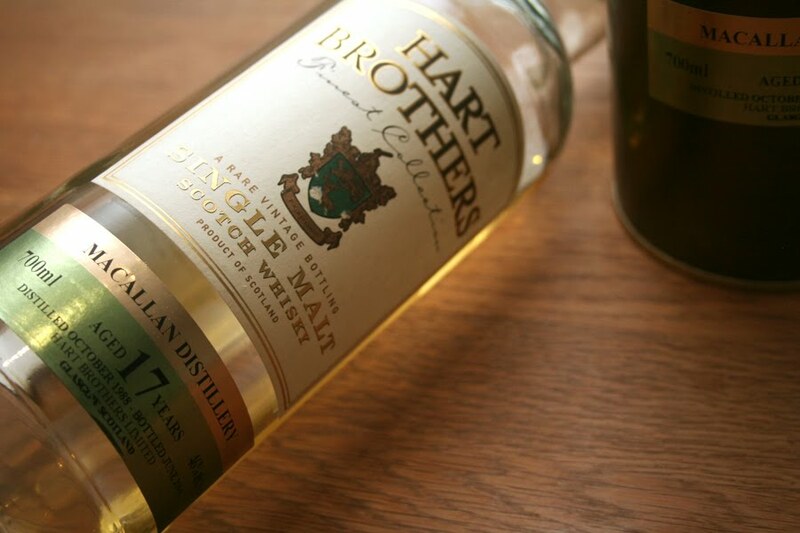 Even when I saw the 18yo version of this Hart Brothers Macallan marked down to only A$35 at the local did not even tempt me into buying or letting anyone else know about it.